Synthetic biodegradable injectable fillers are widely used as relatively safe injectable alternatives to surgical skin rejuvenation. By combining biodegradable materials like hyaluronic acid with non-biodegradable materials like acrylic hydrogel particles, a longer lasting 'semi-permanent' product is created. However, these combination fillers achieve their volume filling effect from the intended host foreign-body response to the microparticles. While this host response increases the longevity of the filler and reduces the risk of migration, it may also potentiate the risk of long-term adverse events. This report documents one such side effect of the semipermanent filler, Dermalive. 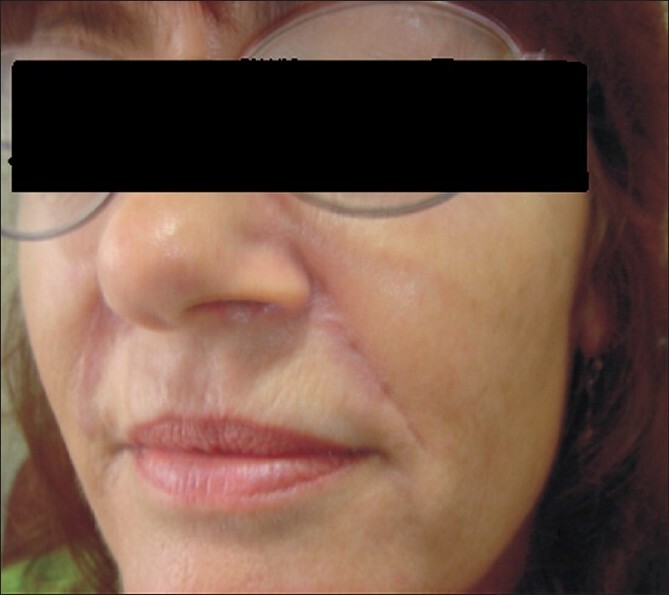 A 51-year-old female patient in good health presented with nodular swellings over both her nasolabial folds. She reported a history of injection of the cosmetic filler 'Dermalive' (Dermatech, Paris, France) at the site of the swelling, 4 years ago at a clinic in Australia. 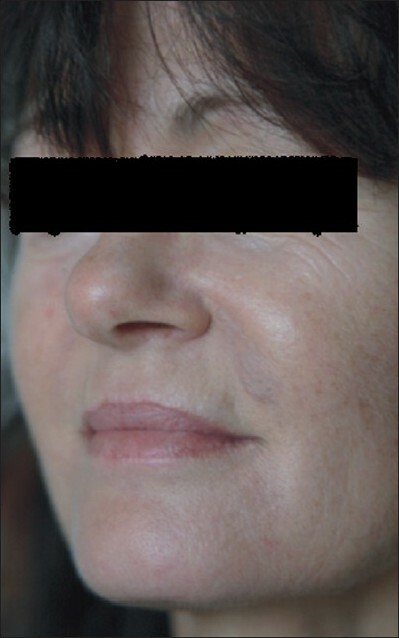 The swellings had appeared 2 years following the filler injection [Figure 1]. She then visited another dermatologist in South-East Asia who suggested that a reinjection of more Dermalive would improve the swelling. The patient then received a reinjection with the same filler at the same site 2 years after the original filler implantation. The patient was not treated with any other filler material. The slightly erythematous palpable indurations had appeared insidiously, and had gradually increased in size and thickness. The swellings worsened in appearance following the second injection. There was no relevant medical history and the patient did not have any autoimmune or allergic diseases. On palpation, there were firm erythematous longitudinal swellings measuring 5 cm Χ 2 cm along the lines of filler implantation at the nasolabial folds [Figure 2]. The nodules did not become prominent on projection from inside the oral cavity, and did not show transilluminance on throwing light from within the oral cavity using a pen torch. The patient was emotionally devastated about these reactions, and was constantly applying camouflage make-up [Figure 3]. We treated the patient with 3 injections of Triamcinolone (40 mg/ml), followed by 3 more injections of 10 mg/ml Triamcinolone at monthly intervals, with good reduction of the swelling on the left nasolabial fold, but only minimal reduction in the size of the swelling on the right side [Figure 4]. As the patient was willing to accept cosmetic surgery, a surgical excision was carried out by the plastic surgeons and the tissue was sent for a histopathological evaluation. Operative findings indicated well encapsulated, grayish white, multilobulated dermal nodules. The wound was thoroughly cleaned and sutured in layers after achieving complete haemostasis. The subcutaneous tissues were approximated with 5-0 Monocryl interrupted sutures (Ethicon, Inc). 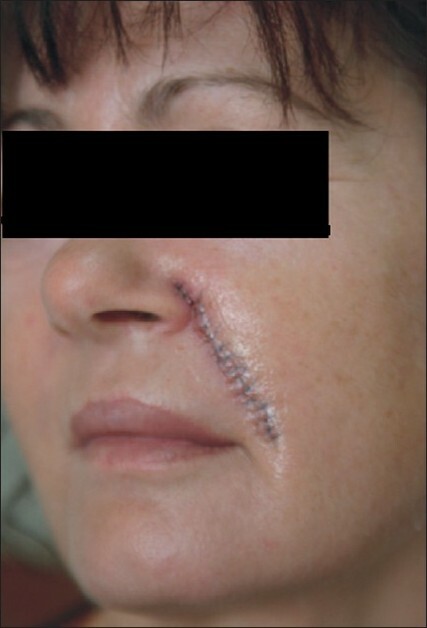 The skin closure was done with 8-0 Ethilon (Ethicon, Inc) [Figure 5]. Operation site healed well and suture removal was done on the 10 th day. 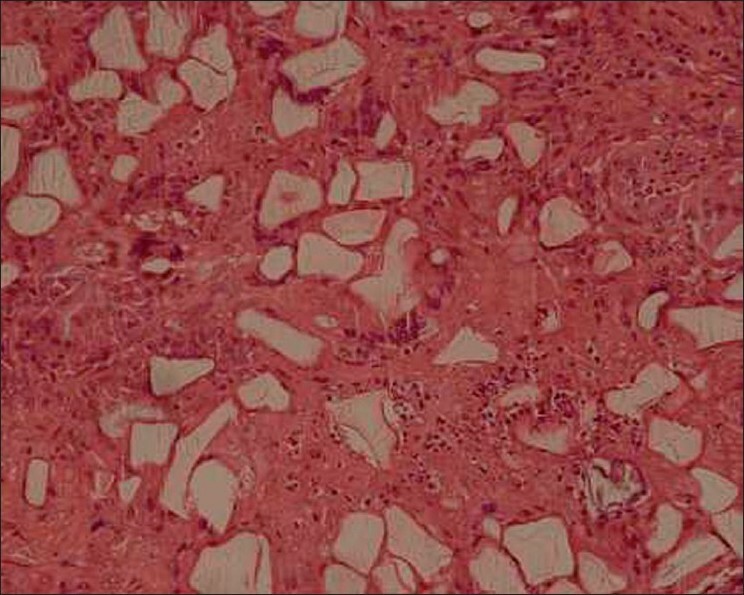 The excision biopsy showed a dermal and subcutaneous adipose tissue infiltrate of foreign body giant cells and numerous irregular crystalline structures [Figure 6] and [Figure 7]. The surgical site showed good healing and our patient was satisfied with the result [Figure 8]. The further treatment plan is to inject autologous fat as a filler to enhance the appearance following surgical excision. Autologous fat transplant is preferred both because of the hesitance on the part of the patient to accept another filler and also to prevent formation of new granulomas and foreign body reactions, which are known to occur even with temporary fillers like hyaluronic acid. Treatment options include intralesional steroids, 5-fluorouracil (5-FU), anti-inflammatory and immunomodulatory drugs like minocycline, rifampicin or hydroxychloroquine. , Anecdotal reports also suggest some relief with the use of nonsteroidal anti-inflammatory drugs (NSAIDs), antihistamines and Tacrolimus. In case of widespread lesions or repeated failure of conservative therapies, surgical excision is the treatment of choice. Surgical extirpation can also allow a dermatologist to prevent the cutaneous side effects of intradermal steroid or 5-FU injection. A histopathological confirmation is recommended before undertaking a surgical excision of the granuloma. 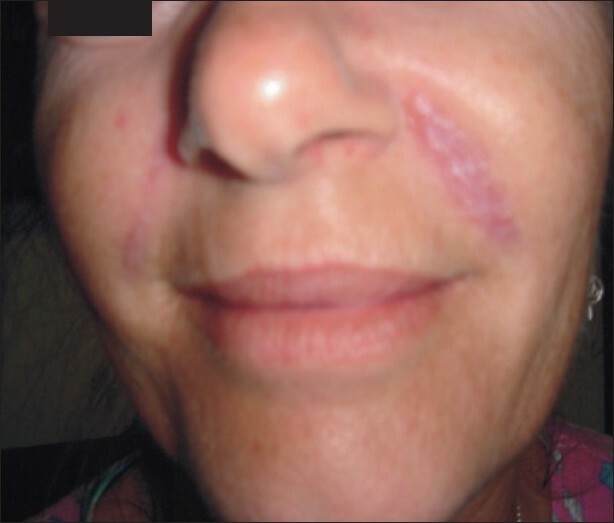 The production of Dermalive was stopped in 2007 following multiple reports of severe adverse events, with granuloma formation being the most dreaded long-term complication. Dermalive fillers had never received FDA approval for cosmetic use in the United States. Dermalive fillers were never available in India. Products available in India include hyaluronic acid fillers, calcium hydroxylapatite, polylactic acid fillers, collagen-based fillers, silicone and polyacrylamide-based fillers. All of the aforementioned fillers can potentially induce nodules, lumps and granulomas; however, hyaluronic acid fillers are safer due to their temporary nature and response to hyaluronidase injections. The purpose of this case report is to highlight the awareness on the risk of complications in semi-permanent fillers, and to reinstate the importance of proper techniques in minimizing complications. The long-term complications can be particularly devastating, and thus, it is important to have a long term follow-up of patients injected with permanent and semi-permanent fillers. Informed consent on potential inflammatory sequelae when working with these injectables is mandatory. Official documentation of all adverse effects with dermal filler(s) implantation must be made mandatory in order for cosmetic physicians and surgeons to make an informed choice when using injectable fillers. 1. Bergeret- Galley C, Latouche X, Illouz YG. The value of a new filler material in corrective and cosmetic surgery: Dermalive and Dermadeep. J Aesth Plas Surg 2001;25:249-55. 2. Alijotas-Reig J, Garcia-Gimenes V. Delayed immune- mediated adverse effects related to hyaluronic acid and acrylic hydrogel dermal fillers: clinical findings, long-term follow-up and review of the literature. J Eur Acad Dermatol Venereol 2008;22:150-61. 3. Lowe NJ, Maxwell CA, Patnaik R. Adverse reactions to dermal fillers: review. Dermatol Surg 2005;31:1616-25. 4. Angus JE, Affleck AG, Leach IH, Millard LG. 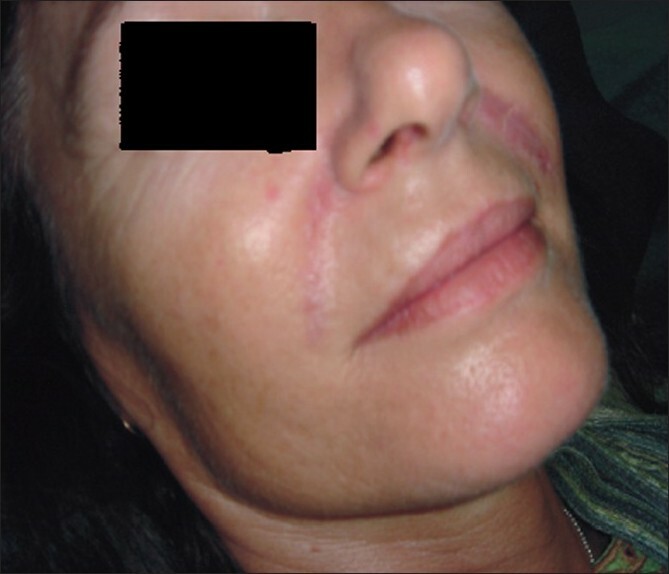 Two cases of delayed granulomatous reactions to the cosmetic filler Dermalive, a hyaluronic acid and acrylic hydrogel. Br J Dermatol 2006;154:1077-9. 5. Vargas-Machuca I, Gonzαlez-Guerra E, Angulo J, del Carmen Fariρa M, Martνn L, Requena L. Facial granulomas secondary to Dermalive microimplants. Report of a case with histopathologic differential diagnosis among the granulomas secondary to different injectable permanent filler material. Am J Dermatopathol 2006;28:173-7. 6. 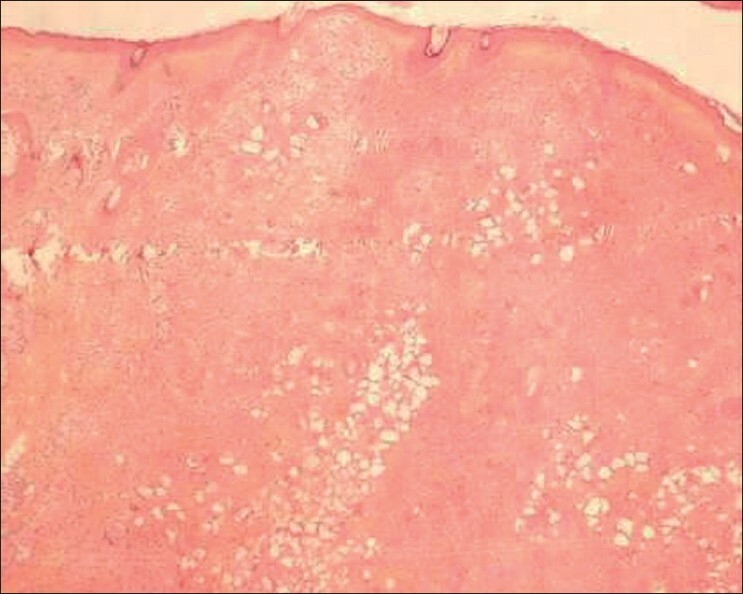 Steenkiste E, Marien K, Van den Oord J. Dermalive granuloma: A lesion with distinctive histological features. (Internet J Dermatol) 2005;3:1531-3018. 7. Sidwell RU, Dhillon AP, Butler PE, Rustin MH. 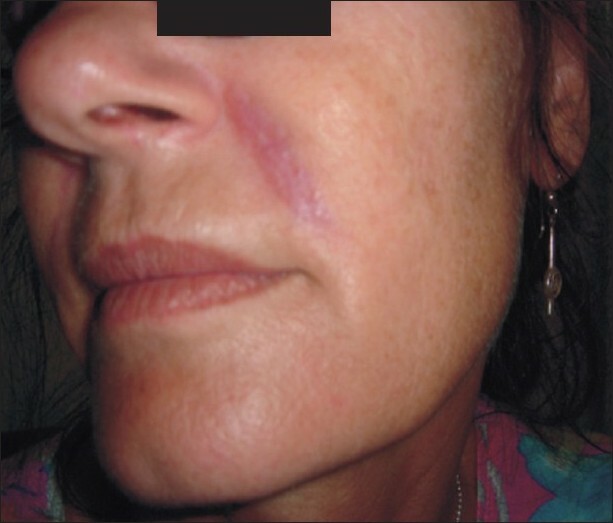 Localized granulomatous reaction to a semi- permanent hyaluronic acid and acrylic hydrogel cosmetic filler. Clin Exp Dermatol 2004;29:630-2. 8. Requena C, Izquierdo MJ, Navarro M, Martνnez A, Vilata JJ, Botella R, et al. Adverse reactions to injectable aesthetic microimplants. Am J Dermatopathol 2001;23:197-202. 9. De Boulle K. Management of complications after implantation of fillers. J Cosmet Dermatol 2004;3:2-15. 10. Brody HJ. Use of hyaluronidase in the treatment of granulomatous hyaluronic acid reactions or unwanted hyaluronic acid misplacement. Dermatol Surg 2005;31:893-97. 11. De Boulle K. Management of complications after implantation of fillers. J of Cosmetic Dermatol 2004;3:2-15. 12. Lemperle G, Rullan PP, Gauthier-Hazan N. Avoiding and treating dermal filler complications. J Plast Reconstr Surg 2006;118:92S-107S. 13. Wolfram D, Tzankov A, Piza-Katzer H. Surgery for foreign body reactions due to injectable fillers. Dermatology 2006;213:300-4. 14. Rossner M, Rossner F, Bachmann F, Wiest L, Rzany B. Risk of severe adverse reactions to an injectable filler based on a fixed combination of Hydroxyethylmethacrylate and ethylmethacrylate with Hyaluronic acid. Dermatol Surg 2009;35:367-74.